Waveform cross-correlation coefficients (CCs) have often been used to investigate clustering of earthquakes. Such techniques, however, have rarely been applied to waveform data recorded by ocean-bottom seismometers (OBSs). The data recorded by some OBSs are strongly influenced by site effects such as the existence of unconsolidated sediment layers. The resulting waveforms tend to have a monotone frequency so that the calculated CCs stay artificially high, and false delay times are obtained at certain multiples of the period. This effect also varies from place to place. To overcome such problems, CC measurements were first performed using multiple time windows with different lengths in order to reject unstable results. Station-specific CC thresholds were then objectively determined based on the CC distributions. This method was applied to seismic measurements obtained by OBSs deployed off the Kii Peninsula from 2003 to 2007 in order to identify characteristic hypocenter patterns. Two types of earthquake clusters were found. The first occurred within the oceanic mantle, and the component events were linearly aligned along the NNE direction. Such earthquakes are considered to occur on preexisting faults due to dehydration of the serpentinized mantle. The second type of cluster consisted of interplate earthquakes that occurred at the southern tip of the Kii Peninsula. These are thought to be the result of stress caused by local structural heterogeneity of the dense rock body. Cross-correlation coefficients (CCs) are used to determine the degree of similarity between seismograms. Because an observed seismogram is a convolution of the source term, path effects, site effects, and instrumental responses, earthquake pairs with high CC values are considered to have close hypocenters and similar focal mechanisms (Baisch et al.2008). For a variety of reasons, researchers have attempted to link similar earthquakes and group them into clusters. One reason is to detect repeating earthquakes, which occur at the same asperities on the same fault planes (e.g., Geller and Mueller1980; Igarashi et al.2003). Their magnitudes are roughly comparable, and some of them are characterized by periodic repetition. Another reason is to determine the spatial patterns of hypocenters and associate them with seismogenic structures such as faults (e.g., Cattaneo et al.1999; Ferretti et al.2005). In this case, it is not always necessary that similar earthquakes should have comparable magnitudes, and differences in location are also permitted to some extent. A third reason for grouping earthquakes is to more precisely identify their relative locations within clusters by measuring accurate differential travel times based on CC delay times (e.g., Lin and Shearer2007; Shearer et al.2005). Such studies require only that the waveforms associated with the first pulses be similar. Depending on the desired goal, different CC thresholds are introduced to judge the similarity between waveforms. In spite of these applications, few researchers have applied such cluster analysis techniques to waveform data recorded by ocean-bottom seismometers (OBSs). The most critical difference between on-land seismometers and OBSs is the existence of thick unconsolidated sediment layers beneath the seafloor. As a result, monotone frequencies tend to be dominant in the waveforms recorded by some OBSs. Since these waveforms are intrinsically similar to each other, CC values are artificially high. There is also a possibility that false delay times are obtained at certain multiples of the period (the cycle skipping problem). Such site effects vary from place to place because of the different thickness of the sediment layer. One approach to avoiding unstable CC results due to cycle skipping and other effects would be to directly measure the uncertainty in the time delays. However, there is no easy method of achieving this. 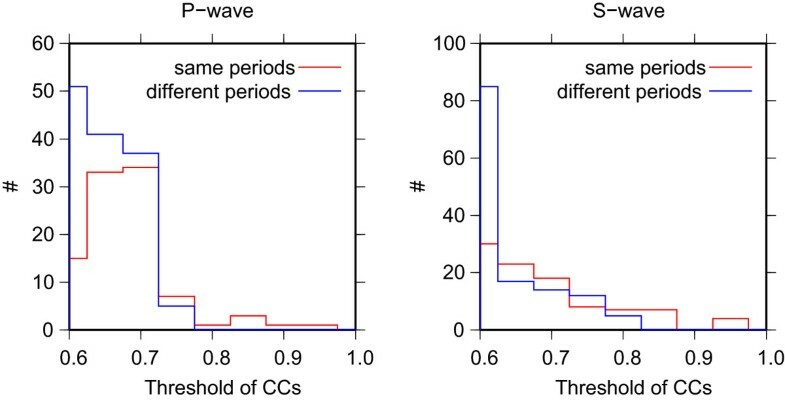 As an alternative approach, Schaff and Waldhauser (2005) calculated two different CCs per event pair using different time window lengths and accepted only results that produced consistent delay times for both. Similar methods have been introduced for measuring S-wave splitting (e.g., Savage et al.2010). In most previous cluster analysis studies, a fixed CC threshold was used for all stations. It was implicitly assumed that there was no difference in site effects or instrumental responses among stations. This assumption might be appropriate for on-land stations, because they are usually installed on stiff outcrops or inside boreholes in order to minimize site effects. In the present study, we first calculated CCs among seismograms recorded by OBSs, incorporating a method designed to prevent cycle skipping, and obtained the CC distribution for each OBS. An objective method is then proposed for determining thresholds (P- and S-waves) for each OBS based on the CC distribution. In this method, the threshold can be arbitrarily selected according to the study objectives. Finally, we applied the proposed cluster analysis method to earthquakes off the Kii Peninsula in order to clarify their hypocenter characteristics. The Kii Peninsula is located at the central part of the Nankai subduction zone in southwest Japan, where the Philippine Sea Plate subducts along the direction N55°W (Miyazaki and Heki2001). At the plate interface, megathrust earthquakes have occurred in a cycle of about 100 to 150 years (Ando1975). The Nankai subduction zone is characterized by a highly deformed subducting slab (Shiomi et al.2008) and has strong heterogeneity in its subsurface structure (e.g., Kodaira et al.2000,2006). This complexity can be expected to affect the development of future megathrust earthquakes in addition to rupture propagation during these events. It is therefore important to carry out a detailed investigation of the seismicity in order to obtain additional constraints on the complex tectonics in this region. 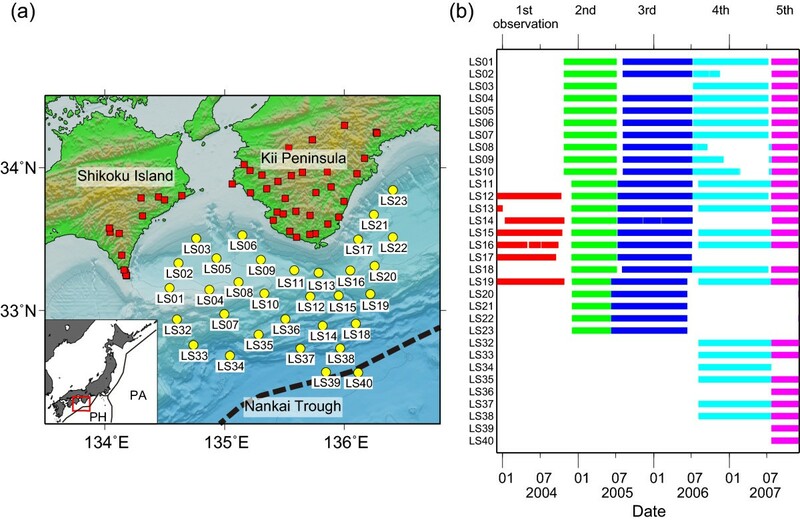 From November 2003 to November 2007, large-scale passive seismic monitoring was conducted around the Kii Peninsula using long-term OBSs (Figure 1). Mochizuki et al. (2010) used this data to determine the earthquake distribution and revealed the large-scale heterogeneous nature of the seismicity. In addition, Akuhara et al. (2013) carried out a tomographic analysis of local earthquakes using data obtained by both OBSs and on-land stations. They determined the three-dimensional (3D) P- and S-wave seismic velocity structures and revealed along-strike segmentation of the structure. Such segmentation may correspond to the large-scale heterogeneity of the seismicity. In the present study, we carried out a cluster analysis in order to focus on smaller-scale features of the seismicity in this region. Study area and observation periods. (a) Study area and station distribution. The yellow circles and red squares show the location of OBSs and on-land stations, respectively. OBS names are also shown. The black dashed line depicts the Nankai Trough. The location of the study area is shown in the inset map with a red rectangle. PA and PH in the inset map represent the Pacific Plate and the Philippine Sea Plate, respectively. (b) Observation periods for each OBS station. The colored horizontal bars show the periods of available data at each station. The locations of OBS stations along the vertical axis are presented in Figure 1a. The data used in the present study were obtained from long-term OBSs deployed off the Kii Peninsula (Figure 1a). The sampling rate was 200 Hz. The natural frequency of the velocity seismometers was 1 Hz. Each OBS was deployed for several months or about a year, after which it was replaced. In this way, continuous observations were carried out over 4 years from November 2003 to November 2007 (Figure 1b). Deployment involved releasing the OBS on the sea surface and allowing it to sink freely to the seafloor. For any given site, the OBS position was subject to a slight variation of several hundred meters during successive observation periods. In the present paper, to specify the station and the observation period, the convention used is the OBS name followed by the observation period number (defined in Figure 1b). For example, OBS LS04 deployed during the fourth observation period is referred to as LS04-4. We used the hypocenter list compiled by Akuhara et al. (2013), which contains offshore microearthquakes that are not listed in the Japan Meteorological Agency (JMA) catalog. These hypocenters were determined by solving an inverse problem for both the hypocenters and the 3D seismic velocity structure, using a double-difference tomography method (Zhang and Thurber2003). Arrival times recorded at permanent on-land stations (red squares in Figure 1a) were also included in the process. The list contained 4,533 hypocenters and 19,187 P-wave and 32,167 S-wave manual arrival time picks on the OBS records. Their magnitudes ranged from -0.7 to 5.1, as determined from the maximum amplitude and the distance to the hypocenter (Watanabe1971), and the estimated completeness magnitude was about 1.5. We extracted P- and S-wave seismograms based on the manual arrival time picks from continuous OBS data. A 3-s-long time window starting 1 s before the arrival time picks was extracted and bandpass-filtered in the frequency range 3.0 to 15.0 Hz. Such a wide frequency range was selected in order to avoid cycle skipping and because, on the ocean bottom, seismic noise tends to be low in this frequency band (e.g., Walker1984; Webb1998). In addition, the length of the time windows was chosen so as to exclude S-wave onsets from the time windows for P-waves. Hereafter, these 3-s-long time windows are referred to as ‘parent’ time windows. From these parent time windows, six shorter ‘child’ time windows were selected, as shown in Table 1. These child time windows had different lengths and were used to perform CC measurements. Although all the OBSs were equipped with three-component velocity sensors, we used only the vertical component in the present study. That is because it was found that the S-waves of the horizontal components were more subject to cycle skipping than those of the vertical components. For two given seismograms A and B, CC measurements were performed six times using the parent time window for seismogram A and the six child time windows for seismogram B. The resulting CCs and delay times are referred to as CC max i and τ max i respectively (i = 1, 2, …, 6). These calculations were then repeated following switching of seismograms A and B, which yielded six additional sets of CC max i and τ max i i = 7 , 8 , … , 12 .
were satisfied, the measurements were regarded as stable, and the results obtained using a 2-s-long child time window were used.Figure 2 shows examples of accepted and rejected measurements using this procedure. Examples of (a) accepted and (b) rejected results by CC measurements with multiple time windows. The top panels show seismogram pairs for the ‘parent’ time window, where the black vertical bars on the seismograms represent manual arrival time picks. The thick horizontal bars above the seismograms represent ranges of ‘child’ time windows. 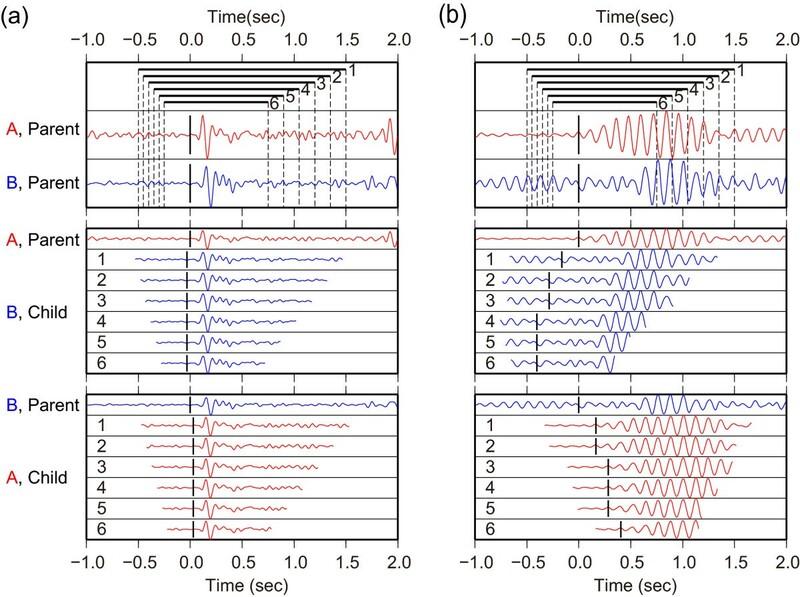 In the lower two panels, the seismograms for six child time windows are slid over a different parent time window. Each seismogram is aligned at τ = τmax, where CC(τ) is a maximum. All the seismograms are bandpass-filtered between 3.0 and 15.0 Hz. We evaluated the effectiveness of the above method by applying it to closely located source pairs in the hypocenter list of Akuhara et al. (2013), whose hypocenter separation was less than 5 km. 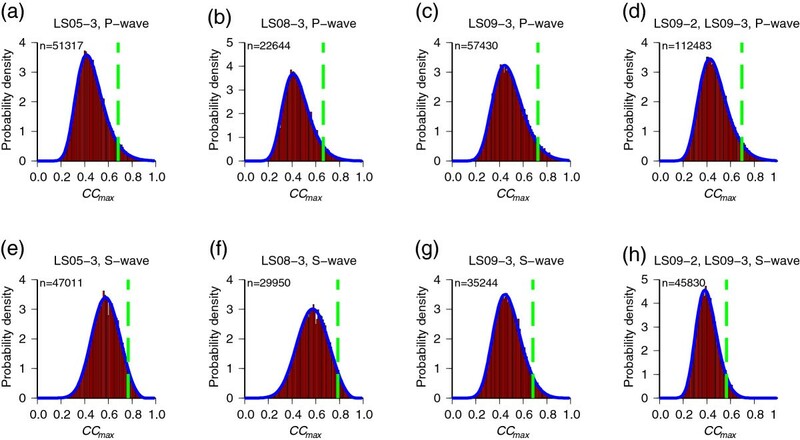 Figure 3 shows both accepted and rejected results for three OBSs (LS05-3, LS08-3, and LS09-3) for both P- and S-waves. The accepted results are centered on τmax = 0, which indicates the consistency of the manual arrival time picks. For S-waves, the accepted τmax values are more scattered about τmax = 0 than those for P-waves. This implies that the manual pick values are less accurate for S-waves, probably because of contamination by the P-wave coda at the S-wave onset. Results of CC measurements (a to f) with multiple time windows at three OBS stations. The red and gray dots indicate accepted and rejected results for pairs of closely located sources (within 5 km), respectively. The histograms for CCmax and τmax are also shown at the right and the top of these plots using the same colors as the corresponding data plots. In Figure 3, it can also be seen that the rejected results tend to have low CCmax values and more scattered about τmax = 0 than the accepted ones. This is considered to be because these phase pairs are so dissimilar that the maximum correlation does not always occur at the phase onsets. In contrast, the rejected S-wave results for LS05-3 and LS08-3 tend to have high CCmax values (>0.6). This is believed to be due to the dominance of a specific range of frequencies in the spectra of S-waves due to the presence of unconsolidated sediments beneath these OBSs, which gives rise to cycle skipping. For LS09-3, the S-wave results appear to be free from such tendencies, which suggests that there are different site effects at this station than at LS05-3 and LS08-3. Note that the OBS positions were close to each other, and the observation periods were identical, so almost the same set of earthquakes was used at each station in the above analysis. For each OBS, we applied the algorithm to earthquake pairs with hypocenter separations of less than 75 km. The number of input phase pairs was about 8.5 million, from which about 2.4 million results were accepted using the above process. In addition, we also applied the method to about 17.0 million phase pairs recorded by OBS pairs at the same sites, but for different observation periods (LS01-1 and LS01-2, for example) to acquire about 4.4 million accepted results. In the following analysis, only the accepted results are used. The next task was to determine the threshold for CCmax, which should vary from one OBS to another due to site effects. CCmax represents the degree of similarity between two phases with respect to the source terms (focal mechanisms and radiation patterns) and the propagation paths. Site effects also influence CCmax, acting as filters in the frequency domain. 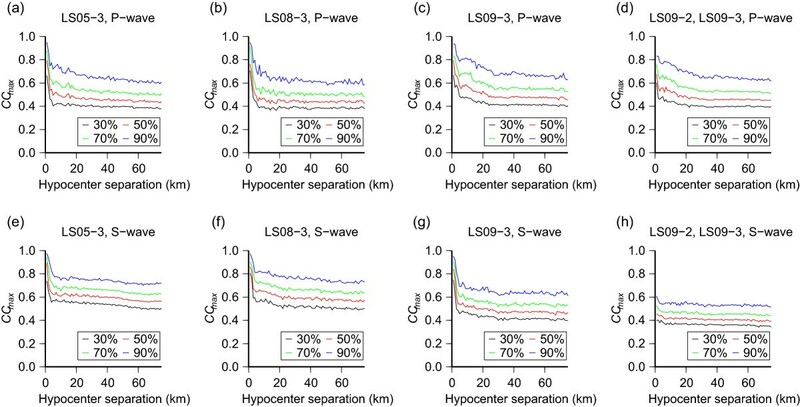 We investigated the effect of the propagation path by examining the relationship between CCmax and hypocenter separations between two events. All phase pairs were first divided into bins based on their hypocenter separations, as determined from the hypocenter list. The cumulative frequency of CCmax was then calculated for each bin, which had a width of 1 km. Here, the cumulative frequency is defined as the percentage of CCmax values that are lower than a given value. Figure 4 shows typical results for the cumulative frequency. It can be seen that it rapidly decreases as the hypocenter separation becomes more than a few kilometers and then remains almost constant. 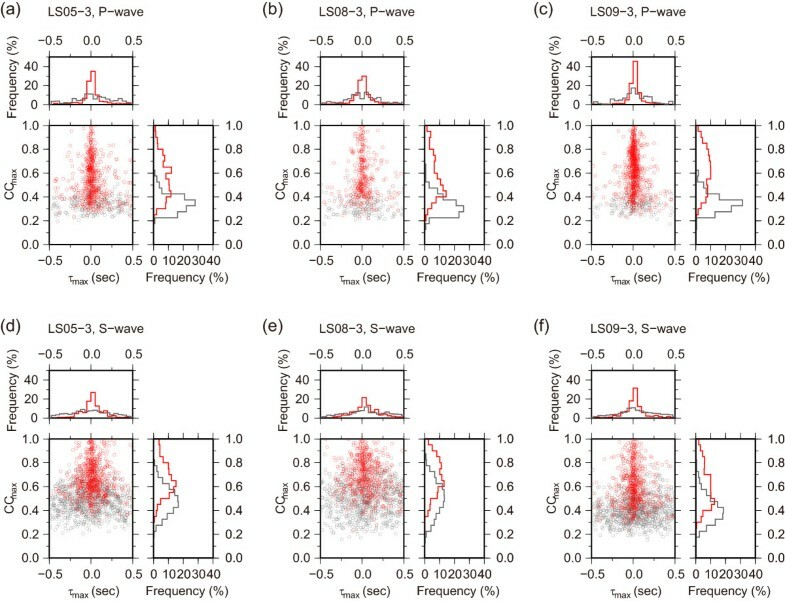 From these results, we assumed that the statistical distributions of CCmax at each OBS become stable (independent of the hypocenter separation) if the sources are separated by more than 30 km. By using such stable CCmax distributions, the bias due to the inhomogeneous source distribution can be avoided. For example, for an earthquake swarm occurring beneath an OBS, the CCmax distribution will be biased towards higher values if closely located pairs are included. Relationship between CC max and hypocenter separation (a to h). The computed CCmax values are divided into hypocenter separation bins with widths of 1 km. The cumulative frequency is then calculated for each bin. The cumulative frequency results for 30%, 50%, 70%, and 90% are plotted. The red histograms in Figure 5 show the CCmax distributions (observed probability density) for source pairs separated by more than 30 km. It is considered that the differences between the P- and S-wave distributions for the same OBS reflect differences in the radiated energy spectrum for the sources, whereas differences among OBSs are most likely due to site effects. Therefore, we used these distributions to determine the CCmax threshold for each OBS. Distributions of CC max (a to h) for earthquake pairs with a large hypocenter separation. The red bars represent the probability density for CCmax calculated for widely separated (>30 km) phase pairs. They are normalized so that their total area is unity. The blue curves are GEV distributions fitted to the probability density distributions. The green dashed lines show the 95th percentile of the distribution, which is used to determine the thresholds. The number of phase pairs used is shown at the upper-left corner of each panel. The distributions shown in Figure 5 are non-Gaussian in that they have asymmetric lobes. However, we found that they were well described using a generalized extreme value (GEV) distribution (Jenkinson1955), which is a statistical distribution of the maximum values of random samples from an arbitrary probability density function. The blue curves in Figure 5 represent GEV fits to the CCmax distributions using the L-moment method (Hosking1990). The CCmax threshold can then be determined as the p-th percentile of the fitted GEV distribution, which represents the value of CCmax for which the cumulative frequency becomes p%. The p value can be chosen in accordance with the study objectives.The different observation periods (Figure 1b) must also be taken into consideration. Site effects are thought to be different among observation periods, even if the locations are almost the same, because different conditions exist for the mechanical coupling between the OBS and the seafloor each time an OBS is deployed. To account for this, we determined the thresholds for all combinations of observation periods in the manner described above (Figures 4d,h and5d,h). We next performed a cluster analysis based on the CCs in order to identify characteristic patterns in the hypocenters around the Kii Peninsula. We defined clusters of similar earthquakes based on hypocenter separations and waveform similarities. 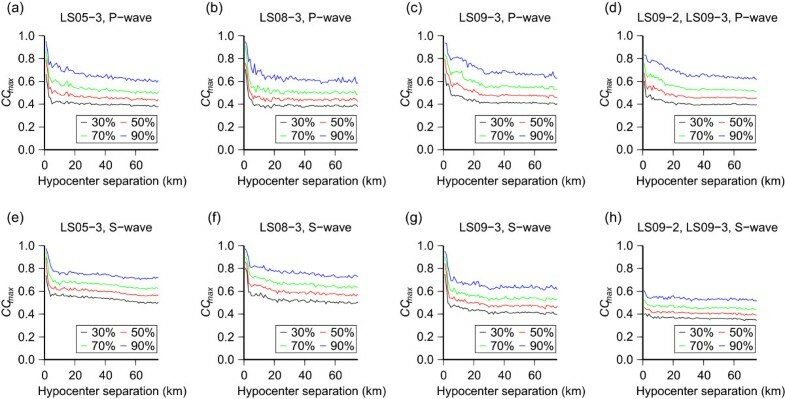 First, any two events satisfying the following conditions were linked together: (1) the hypocenter separation was less than 5 km, and (2) CCmax was greater than or equal to the threshold value for three or more phase pairs, including at least one S-wave pair. The linked earthquakes were then grouped into clusters using the following simple rule: if earthquakes A and B are linked and if B and C are also linked, then A, B, and C are included in the same cluster irrespective of the waveform similarity between A and C. The CCmax thresholds were determined for a given p value in the manner described above. However, if the calculated threshold was lower than 0.6, it was changed to 0.6 because we noticed that waveforms began to appear dissimilar below this value. Figure 6 shows the p value dependence of the number of clusters and component earthquakes. Both are seen to decrease with increasing p. Note that the lower limit for the number of clusters is determined by the maximum hypocenter separation (5 km) and the minimum CCmax threshold value (0.6). Otherwise, one large cluster containing all events would be produced at an extremely low p value. 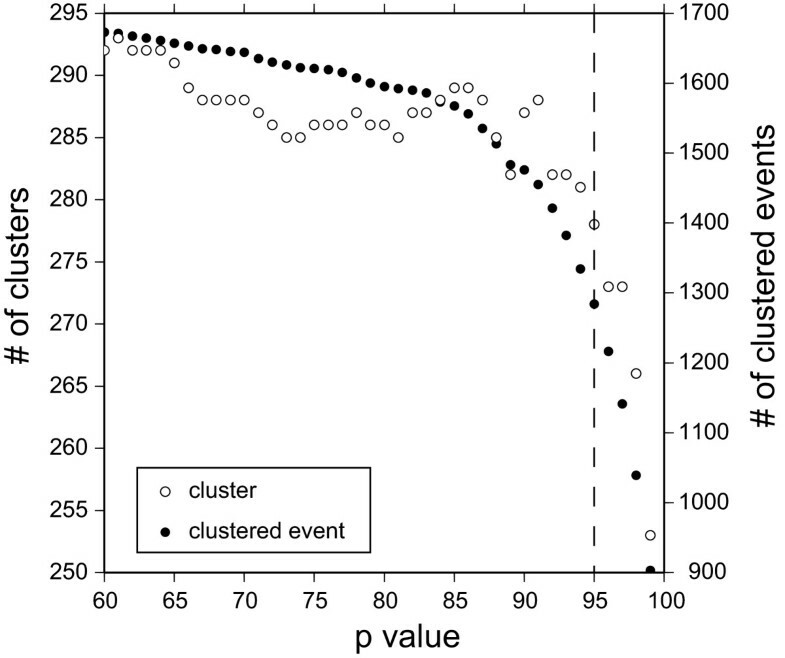 When selecting the appropriate value of p, there is a trade-off between the number of clusters and clustered events, and the CCmax threshold. In the present study, a p value of 95 was chosen, since this is where the two numbers begin to drop rapidly as shown in Figure 6. Figure 7 shows the histograms of the obtained thresholds. Statistical results for cluster analysis with various p values. The open and filled circles denote the number of clusters and clustered earthquakes, respectively. The dashed line is drawn at p = 95, which was selected for this study. Histograms of CC thresholds for P-wave (left) and S-wave (right). The red lines show the number of thresholds from event pairs with the same observation period. The blue lines show the number from event pairs with different observation periods. We then relocated the hypocenters of the linked earthquakes using the cross-correlation results in order to improve the accuracy of their relative positions. This was performed by means of the double-difference algorithm (Waldhauser and Ellsworth2000) using the tomoDD program (Zhang and Thurber2003), which supports 3D velocity structures. The 3D P- and S-wave velocity model used was obtained from a previous tomographic analysis (Akuhara et al.2013). As input data for tomoDD, we used the differential travel time calculated from τmax, in addition to the absolute and differential travel times from the hypocenter list. Additional information concerning the relocation process is listed in Table 2. In spite of the use of CC delay times, there was no remarkable change in appearance following relocation. This may be due to the relatively small number of differential travel times from the CC measurements. The root mean square values of the differential travel time residuals from the CC measurements were 0.017 and 0.020 s for P- and S-waves, respectively. 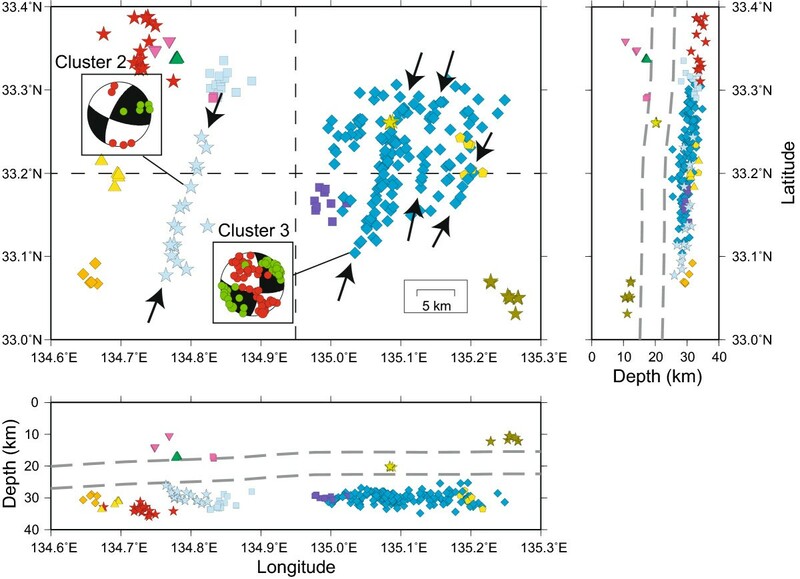 If it is assumed that the P- and S-wave velocities are 7.0 and 3.8 km/s, respectively, which are actually somewhat larger than typical values for the oceanic crust, the relative location error can be estimated to be about 100 m.
As a consequence of the cluster analysis, we obtained 278 clusters and 1,284 clustered earthquakes from a total of 4,523 earthquakes. Figure 8 shows the 49 clusters that contain five or more earthquakes. Figure 9a shows seismograms for the earthquakes in cluster 1 in Figure 8; it can be seen that they are extremely similar. Distribution of similar event clusters containing five or more earthquakes. An individual combination of colors and symbols is assigned to each cluster. The gray circles in the background represent non-clustered earthquakes or earthquakes in clusters of less than five. The black solid and dashed squares denote the areas shown in Figures 10 and12, respectively. The black line A-B shows a profile of the vertical cross section in Figure 11. Seismograms (a) and focal mechanisms (b) for earthquakes belonging to the same cluster (cluster 1). (a) All the seismograms were bandpass-filtered between 3.0 and 15.0 Hz. The gray shaded area represents the parent time window for P- and S-waves. The thick black bars are manually selected arrival times. The early portions of the seismograms are enlarged in the lower panel. (b) P- and T-axes for each focal mechanism projected onto the lower hemispheres with red and green circles, respectively. The underlying focal mechanisms are representative of the cluster. To investigate the characteristics of each cluster, we determined the focal mechanisms from the P-wave polarities, which were observed at OBSs, on-land stations, or both, using the FPFIT program (Reasenberg and Oppenheimer1985). We accepted focal mechanisms only if they were determined from eight or more P-wave polarities, observed at stations whose maximum azimuthal gap from the hypocenter was less than 180°. A total of 541 focal mechanisms were acquired in this manner, for which the average half width of the 90% confidence region for the strike, dip, and rake was 6°, 7°, and 9°, respectively. Figure 9b shows the P- and T-axes of the focal mechanisms for cluster 1. Unlike the case for the waveforms themselves, large differences are observed, even if the uncertainties are taken into account. This may be caused by misidentification of the P-wave onsets or polarities due to a low signal-to-noise ratio in the OBS records. Although individual focal mechanisms are not sufficiently reliable, useful information concerning the tectonics can be extracted by gathering them within each cluster. Figure 10 shows an enlarged view of clusters 2 and 3 in Figure 8, located offshore to the southwest of the Kii Peninsula, which are seen to be aligned along the NNE direction. A comparison with the velocity structure model obtained in a previous tomographic analysis (Akuhara et al.2013) reveals that these earthquakes occurred within the oceanic mantle. The P- and T-axes are oriented along the directions normal and parallel to the through, respectively (Figure 10). These axes are consistent with the regional stress field, which is considered to be due to slab pulling beneath Kyushu Island and the resistance of the mantle to the subduction motion (Wang et al.2004). The strike for each focal mechanism almost agrees with the cluster alignment direction. 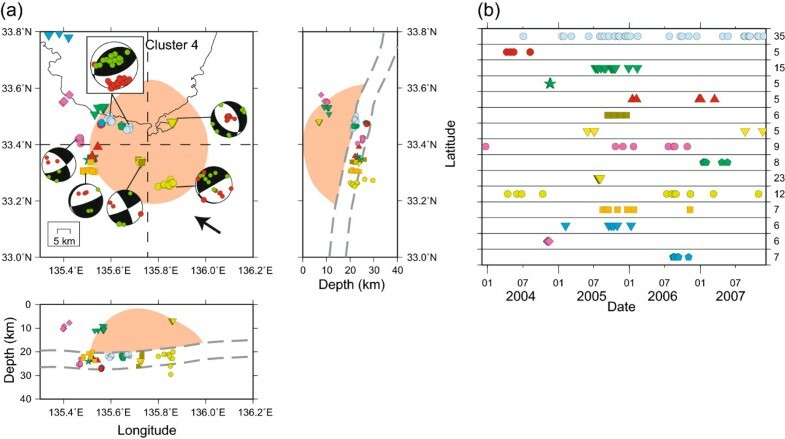 As shown in Figure 11, it was also found that the clusters form the lower plane of a double seismic zone, separated from the upper plane by a distance of about 15 km. 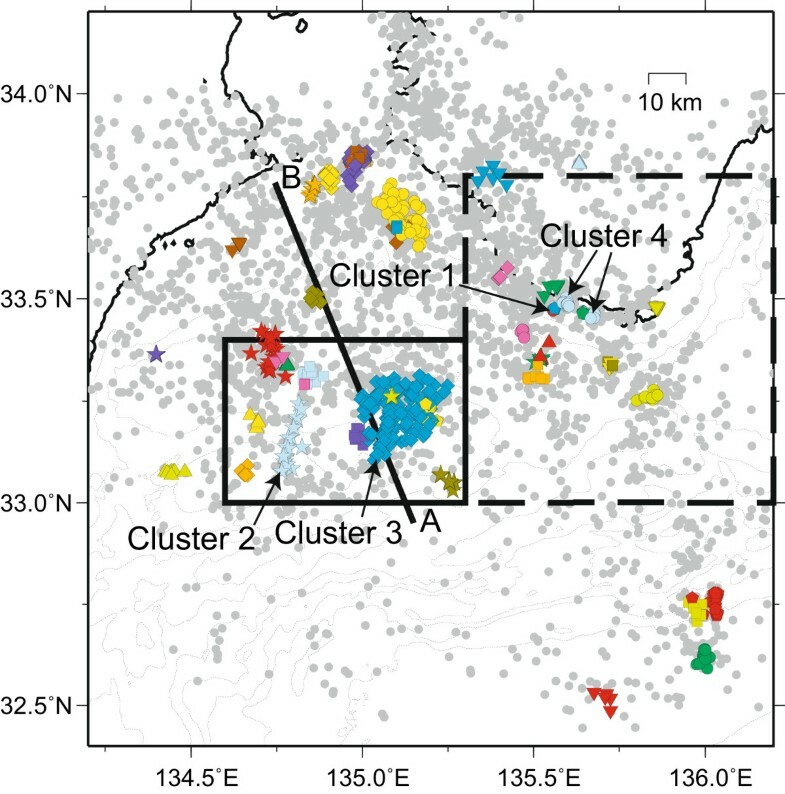 Hypocenter distribution of NNE-trending linearly aligned clusters (clusters 1 and 2). The same symbols and colors are used for earthquake clusters with five or more earthquakes as those in Figure 8. The gray dashed lines in the cross sections represent the plate interface and the oceanic Moho estimated by a previous tomography analysis (Akuhara et al.2013). The locations of the cross sections are represented by black dashed lines. Focal mechanisms are shown using the same notation as in Figure 9b. The arrows indicate the lineation directions for the earthquake clusters. Cross section along line A-B in Figure8. Earthquakes located within 7.5 km on either side are projected onto the section. The black circles depict non-clustered earthquakes or earthquakes in clusters of less than five. The pink and green dashed lines are the inferred upper and lower planes of the double seismic zone. The other notation is the same as in Figure 10. Clear lineation of earthquakes has often been interpreted as being associated with faults, on the basis of additional geological evidence (e.g., Waldhauser et al.1999). Unfortunately, in the present case, no geological evidence is available that directly supports the existence of faults, because of the difficulty of offshore exploration at the depths involved. However, the geological features of the shallow part of the Philippine Sea slab can be helpful in placing some constraints on the cause of cluster lineation. Tsuji et al. (2013) conducted reflection seismic surveys seaward of the Nanakai Trough, off the Kii Peninsula, to identify a fault network within the oceanic crust, where some of the faults cross the Moho to the upper mantle. The fault network is similar to the clusters in the present study in that both comprise a sequence of parallel lineaments. In addition, the NNE trend of the lineaments is different from that of the fossil spreading axis of the Shikoku Basin with a NW-SE strike (Okino et al.1994; Kido and Fujiwara2004), along which faulting is expected to occur easily. This falsifies the hypothesis that the faults were formed long after subduction began, because once the slab has been subducted to a certain depth, the only possible mechanism for creating such a large fault is by trough-parallel regional tension. However, such tension is more likely to produce NW-SE faults along the direction of the fossil spreading axis. Consequently, it is considered that the earthquake clusters represent preexisting faults that were formed before subduction occurred. It is well established that faults act as conduits in the outer trench regions, allowing fluids to seep into the mantle, and promote its serpentinization (e.g., Ranero et al.2003; Faccenda et al.2009). The serpentinized mantle dehydrates under certain conditions of temperature and pressure to cause intraslab earthquakes by overcoming the high confining pressure, which is a plausible explanation for the double seismic zones (Hacker2003). Yamasaki and Seno (2003) calculated the temperature structure beneath the Kii Peninsula, and demonstrated that dehydration of the metamorphosed crust and serpentinized mantle could lead to upper and lower planes, respectively. The expected separation of the two planes is approximately 10 to 20 km, which is consistent with the results obtained in the present study. Therefore, it can be concluded that these clustered earthquakes occur due to dehydration of the serpentinized mantle along preexisting faults. Miyoshi and Obara (2010) also reported the existence of a lower plane at the northeastern part of the Kii Peninsula and concluded that it is the result of slab bending. However, on the basis of the number of earthquakes and the separation between the upper and lower planes, the lower plane identified by Miyoshi and Obara (2010) is considered to have a different origin to that in the present study. As shown in Figures 8 and12, cluster 4 at the southern tip of the Kii Peninsula contains more than 30 earthquakes with a low-angle thrust-fault focal mechanism. The magnitude range is from 1.0 to 3.4. By comparing the velocity structure model and the convergence direction of the PHS plate, it can be concluded that these earthquakes occur at the plate interface. Focal mechanisms for neighboring clusters are also shown in Figure 12, revealing that interplate earthquakes are specific characteristic of cluster 4. Note that the cluster indicated by lime circles also has a low-angle thrust focal mechanism, but it is located within the oceanic crust. In addition, compared to the other clusters, cluster 4 is characterized by a large number of earthquakes and long periods of seismic activity (Figure 12b). Hypocenter distributions of cluster 4 and neighboring clusters (a) and their time histories (b). (a) The light brown shaded region is a schematic illustration of a high-density rock body (Kodaira et al.2006). The black arrow indicates the current convergence direction of the PHS plate. The other notation is the same as in Figure 10. (b) Time histories of each cluster. The color and symbols assigned to each cluster are the same as in Figure 12a. The numbers of earthquakes within each cluster is indicated at the right side of each row. 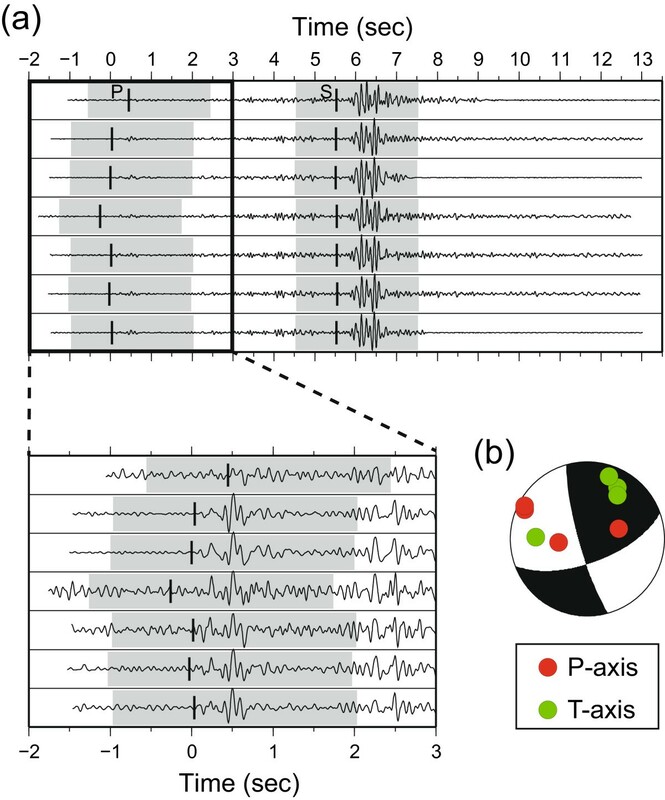 The repeated occurrence of similar earthquakes on the plate interface has been interpreted as slip at localized asperities (Igarashi et al.2003). Kodaira et al. (2006) discovered a high-density rock body embedded in the overriding plate at almost the same location as the interplate clusters, although its center is shifted slightly southeastward (Figure 12). They estimated the excess normal stress to be more than 30 MPa, taking account of the results obtained from gravity observations (Honda and Kono2005), which suggests that the embedded rock is a strong asperity at the plate interface. Moreover, the rate of interplate coupling drastically changes at the northeastern edge of the rock body: the coupling rate is higher seaward and lower landward (Miyazaki and Heki2001; Saiga et al.2011). Hence, it is considered that both sides of the plate interface are strongly coupled due to the weight of the rock body, with the strain being concentrated at the northwestern edge, where the interplate cluster is located. Long-term observations of these interplate earthquakes might provide insights into the process of strain accumulation during interseismic periods, which leads to megathrust earthquakes. In the present study, CC results for records obtained by OBSs deployed off the Kii Peninsula were used to carry out a cluster analysis of earthquakes. We proposed methods to deal with problems intrinsic to OBS data, namely the predominance of monotone frequencies and varying site effects among stations. These methods involved multiple CC calculations, using time windows with different lengths, and appropriately determining the CC threshold, which varied among OBSs. By applying the appropriate threshold, we identified clusters of similar earthquakes. There was found to be two types of characteristic clusters. The first existed within the oceanic mantle and was aligned along the NNE direction, forming the lower plane of a double seismic zone. This is considered to represent a preexisting fault formed before subduction began. It is proposed that these earthquakes are the result of dehydration of the serpentinized mantle along this fault. The second finding is a cluster of interplate earthquakes at the southern tip of the Kii Peninsula. We proposed that the primary generation mechanism for earthquakes in this cluster is strain accumulation beneath a high-density rock body. The tectonics of most ocean areas remains unclear. We believe that the proposed method can be easily applied to OBS data from other areas, allowing new insights into the surrounding tectonics to be obtained. We thank Kazuo Nakahigashi, Tomoaki Yamada, Masanao Shinohara, Shin'ichi Sakai, Toshihiko Kanazawa, Kenji Uehira, and Hiroshi Shimizu for collecting and processing the OBS data. This research was supported by a grant from the Global COE Program, ‘From the Earth to "Earths",’ Observation and Research Program for Prediction of Earthquakes and Volcano Eruptions, and JSPS KAKENHI Grant Number 26-10221, all from the Ministry of Education, Culture, Sports, Science and Technology of Japan. General Mapping Tools (Wessel and Smith1991) was used for drawing figures. We are grateful to two anonymous reviewers for the thoughtful comments and suggestions. TA performed the entire analysis and drafted the manuscript. KM participated in the acquisition of data and the design of the study, and helped to draft the manuscript. Both authors read and approved the final manuscript.